Weymouth passenger and car ferry ticket prices, timetables, ticket reservations and information for ferries sailing from Weymouth to Guernsey, Jersey Islands and St Malo. Compare all available Weymouth ferry ticket prices in real time and book the cheapest available Weymouth car and passenger ferry tickets sailing to and from Weymouth, Guernsey, Jersey Islands and St Malo with Condor Ferries ferries online with instant confirmation. Book Weymouth Ferry Tickets with Condor Ferries for ferries sailing from Weymouth to Guernsey, Jersey Islands and St Malo online in advance to enjoy the cheapest available ferry ticket price. The price you see is the price you pay. There are no hidden extras or surprises such as added fuel surcharges or booking fees and we do not charge you anything extra for paying with a Visa Electron card. The price we quote you for your selected Weymouth passenger or car ferry ticket, onboard accommodation and vehicle type is all you will pay, and that's a promise. To obtain a Weymouth ferry ticket price and book your ferry ticket securely online please use the real time ferry booking form on the left. You are also able to add a hotel at your destination, or anywhere else, to your ferry ticket when completing your ferry ticket reservation. The Classic Seaside Resort of Weymouth, with its fantastic beach and vibrant harbour, nestles perfectly alongside the rugged 'Isle' of Portland, the perfect place for visitors who just want to get away from it all. As the waves crash against the rocks along the dramatic coastline of the 'Isle' of Portland it’s easy to see why this forms part of the World Heritage Coast. Yet just across the bay, Weymouth is home to a safe, clean and sheltered family beach. This coastal town has a safe, sandy beach located minutes from the town centre, a varied choice of places to eat, and plenty of activities and attractions to choose from. Whether you’re looking for a relaxing stroll, local produce, top attractions and events or an activity to jump-start your adrenaline, Weymouth certainly cater for all tastes. The variety on offer at this unique, all year round destination has led to Weymouth & Portland being a popular filming location for both the small and big screen. Weymouth has an all year events programme, with events ranging from an International Beach Kite Festival to a Harley Davidson Parade and Beach Volleyball Championships to Free Summer Firework nights. There are plenty of places to eat and drink in Weymouth, all-year-round events, attractions and activities - there's something for everyone. The Olympic and Paralympic Games are the largest sporting spectacle in the world. Weymouth and Portland will host the sailing events for the London 2012 Olympic and Paralympic Games between July and September 2012. Race areas are in both Weymouth Bay and Portland Harbour and will be a spectacular sight, set against the back drop of the Jurassic Coast. Weymouth's wide and shallow sandy beach is used for swimming and sunbathing during the tourist season, and for beach sport events throughout the year, including beach motocross, the International handball championships and the beach volleyball classic. The international kite festival, held in May each year on Weymouth Beach, attracts around 40,000 spectators to the esplanade from around the world. Condor Ferries Weymouth Terminal is easily accessible and offers a range of facilities. Our services operate between Weymouth and Guernsey, Jersey and St. Malo, Brittany. Take a look at the Weymouth Destination Guide and Weymouth Ferry Times. Pack your car with everything you need to enjoy your ferry trip to the full without the worry of excess baggage charges. The fast ferry to Guernsey operates year round from Weymouth, with daily summer sailings. Avoid the usual stress and strain of airport travel and travel on the fast ferry service from the south coast port of Weymouth, via Guernsey. The ferry to Jersey operates year round, with daily summer sailings. 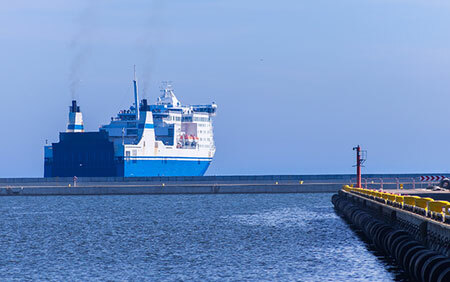 Year round fast ferry service to St. Malo requiring a simple change to a connecting ferry in either Guernsey or Jersey. The perfect way to sample the delights of the Channel Islands and ideal to give your children or pets a break from the ferry journey. Motorists should check in a minimum of one hour before departure. Foot passengers should check in a minimum of 40 minutes before departure. Weymouth is 8 miles south of Dorchester on the A354. Follow the signs to Ferries/Ferry Port, which is on the left. Weymouth can also be approached from the A35 at Poole by following the A351, then the A352, and then the A353 into the Town Centre. If using a Satellite Navigation System to get to Weymouth Ferry Terminal please use the postcode DT4 8DX. Whether arriving or departing from Weymouth Ferry Terminal there are plenty of local taxi companies to assist with your travel requirements. If arriving by train you may wish to take a 5 minute taxi from Weymouth Train Station to Weymouth Ferry Terminal. Buses arrive and depart from the Kings Statue which is a 10 minute walk from Weymouth Ferry Terminal. Whether you are looking to travel regional or national there are several services to meet your needs. South West Trains are the main operator in and out of Weymouth Train Station, with a service to London Waterloo. Weymouth Ferry Terminal is 15-20 minute walk from Weymouth Train Station. Please ensure when arriving in to Weymouth Train Station you leave plenty of time to check in at Weymouth Ferry Terminal. When you arrive at Weymouth Ferry Terminal for your Condor ferry to the Channel Islands or France follow the signs to either the passenger check in or the car check in, where you can collect your boarding pass for your sailing with Condor Ferries. Best Price Guarantee - We always offer you our lowest available Condor Ferries passenger and car ferries ticket price to and from Weymouth. There are no hidden extras or surprises such as added fuel surcharges or booking fees and we also we do not charge you anything extra for paying with a Visa Electron card. The price we quote for your selected Weymouth ferry ticket, onboard accommodation and vehicle type is all you will pay, and that's a promise! In the unlikely event you find the same all inclusive Weymouth ferry ticket cheaper in the brochure of any other tour operator we promise that we will do our best to beat that price or offer you the choice of requesting a refund. To book Weymouth car and passenger ferry tickets please click here. At ferryto.co.uk you are able to obtain live Weymouth ferry ticket prices, check availability and book car and passenger ferry tickets to and from Weymouth at our lowest available ticket price. Ferryto.co.uk is part of the world's largest online ferry ticket distribution network providing the ability to book over 80 major European ferry operators including to Weymouth and to over 1,200 other ferry routes throughout the UK, France, Spain, Ireland, Holland, Eastern Europe, the Mediterranean, the Baltic and North Africa.